In The Structure of Scientific Revolutions (1962, 2nd ed. 1970). Excerpt 'Revolutions as Changes of World View', in Joseph Margolis and Jacques Catudal, The Quarrel between Invariance and Flux (2001), 35-36. There was a time when we wanted to be told what an electron is. The question was never answered. 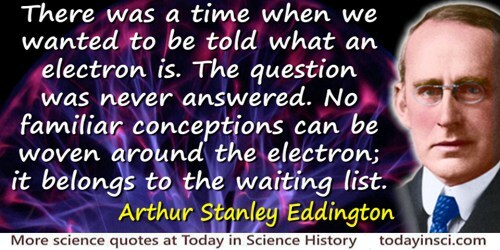 No familiar conceptions can be woven around the electron; it belongs to the waiting list. The Nature Of The Physical World (1928), 290.